Egyptian security forces killed 10 terrorists and captured 20 in an operation in the Sinai Peninsula over the past 48 hours, state news agency MENA reported Sunday. State-run news website Al-Ahram quoted a senior security official as saying that the army has launched "Operation Desert Storm" in the Suez District to eradicate terror and violence in Sinai. 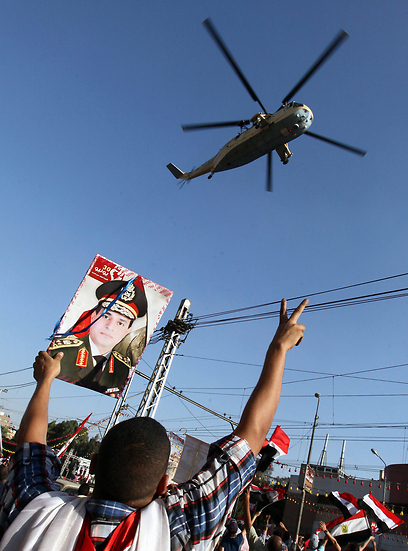 According to the official, the army plans to besiege terror hubs, particularly in north and central Sinai. According to the same source, the army will closely monitor the roads connecting Sinai to the Suez and Cairo districts. According to estimates, the number of terrorists in this area does not exceed 500. Egypt's Sinai Peninsula, which borders Israel, has been the scene of increasing violence since a coup that overthrew Islamist president Mohamed Morsi on July 3. Terrorists have conducted almost daily attacks on security forces in the area, where security had already deteriorated since the 2011 uprising that overthrew then-president Hosni Mubarak. Meanwhile, interim Interior Minister Mohamed Ibrahim was quoted as saying by Al-Ahram that sit-in protests in Cairo by supporters of Morsi will be "brought to an end soon and in a legal manner." Ibrahim said the protests would be cleared in line with complaints filed by residents in the area. Supporters of Morsi's Muslim Brotherhood have been manning two main vigils in the capital for a month, demanding Morsi be reinstated after his July 3 overthrow by the army. "I assure the people of Egypt that the police are determined to maintain security and safety to their nation and are capable of doing so," Ibrahim told a graduation ceremony at the national police academy. "We will very decisively deal with any attempt to undermine stability," said Ibrahim, who is in charge of the police. A Health Ministry official said Sunday the death toll in weekend clashes in Cairo between supporters of Egypt's ousted president and security forces backed by armed civilians has risen to 72. Khaled el-Khateeb, head of the ministry's emergency and intensive care department, says another eight died in clashes in the Mediterranean city of Alexandria. In a Sunday statement, he said 792 people were wounded in both incidents, which spanned Friday and early Saturday. 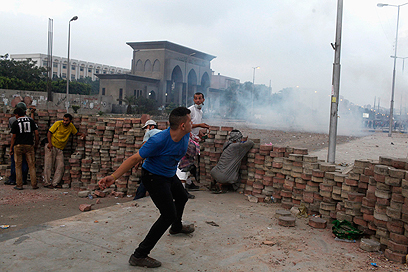 The Cairo violence took place when pro-Morsi protesters sought to expand their sit-in camp by moving onto a nearby main boulevard, only to be confronted by police and armed civilians. It was the deadliest single outbreak of violence since the military ousted Morsi in a July 3 coup that followed protests in which millions demanded he step down. See all talkbacks "Report: 10 gunmen killed in 'Operation Desert Storm' in Sinai"